For Mark Wilke, the hatchery business remains sunny, although continually evolving. 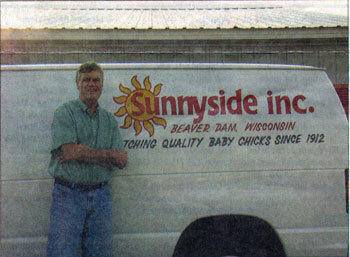 Wilke is the owner of Sunnyside, Inc., in Beaver Dam - one of only a hadful of hatcheries remaining in Wisconsin today. "Sunnyside goes back to my Grandpa's time," he says of his paternal grandfather Oscar, who began hatching chickens o nhis Waunakee farm in 1912. "The story goes that there were seven boys in the family and my grandpa was the youngest of them," Wilke explains. "As the boys got older and got married, they each got a part of the farm. My grandpa was the youngest one in line so he got the worst part of the farm." Mark Wilke, owner of Sunnyside, Inc., in Beaver Dam, loves his job and the people hw works with each day. For Wilke, the changing landscape of the hatchery business has been an adventure - ever since his grandfather Oscar founded the business. According to Wilke, the farm land his grandfather inherited was on the sunny side of a hill and nearly impossible to farm on. "That farm is still there that my Dad grew up on," he notes. "That's where it all started." In the late 1930s, Oscar started the first Sunnyside Hatchery in Portage. THrough time, the business expanded, with Oscar's children opening locations in Reedsburg, Beaver Dam, Watertown and Madison - which eventually moved to Oregon. Wilke's father, Rodney, started the location in Beaver Dam in 1952. After completing college, Wilke returned to the hatchery to work with his father and ultimatley take over the operation. "This is the only job I've ever really had," he says. " Not many people do it anymore. When dad started, there were three other hatcheries in Beaver Dam alone." Today, the Sunnyside, Inc. location in Beaver Dam is the only one remaining of the original family branches. Wilke says that over time, the number of hatcheries - and the type of clientele they supply - has changed in many ways. "More people lived on famrs [when my Grandfather started this business] and everyone had chickens," Wilke states, adding that there were over 400 hacheries like theirs in the state at one time. "Now there's just a few of us that are really catering to the smaller producers, like I do now." In the '90s, Wilke says, he sold the more commercial portion of the family business to keep the part he enjoys the most - the seasonal market. Sunnyside currently specializes in Sunnyside Jumbo Broilers, White Leghorns, Hobby Farm Assorted, Started Pullets, Dual Purpose (Brown and Special Black), White and Bronze Turkeys and Ducklings (Mallards, White Pekins and Rouens). The Special Black breed is quote popular, Wilke notes, with the Asian market, which has been "a big part of what we do." According to Wilke, there has been a resurgence of the "niche market and small-market types" of customers. "We still have farm-type people," he says, "but now there are hobby farmers, people that work in town but still live on acreage and CSAs (community supported agriculture) that deliver produce right to the consumer directly." Part of that changing landscape includes farmers' markets too, he adds. "I think people are concerned about the quality of food they are getting now," Wilke says. "They don't like the idea that their food is coming from Central America or other places. They want to know where it's coming from and want to support local producers." In addition, Sunnyside supplies a number of people have regained the desire to have their own small layer flock in their backyard as well as a number of Amish families throughout the state. Sunnyside runs daily deliveries across the state, traveling "about as far as we can physically run in a day and get back. We cover pretty much a good chuck of the state of Wisconsin," he explains. For Sunnyside's other customers across the Midwest, Wilke says the orders are shipped through the mail. Many operations across the country utilize this approach for all of their business, he adds, but Wilke prefers the one-on-one contact with comsumers when possible. "I basically want to concentrate on the area we've been concentrating on all these years and do it great," he adds, noting that Sunnyside's focus is to always deliver a quality product. "We've seen a lot of changes in the business," Wilke continues. "Nowadays it is an unusual business when you tell people what you're doing. The fact that we've been able to continue it this long is pretty special." As for the future, Wilke says he's looking to see what his next move is going to be. "Every year has its own personality when you're dealing with uncertainties," Wilke states. "It seems like it could be another busy year. I hope to continue as long as I can. I've got good people working with me." — Story by Sara Schoenborn in the newspaper “Agri-View” on Thursday, March 29, 2012.